David Duncan’s Up, Up, and Away! 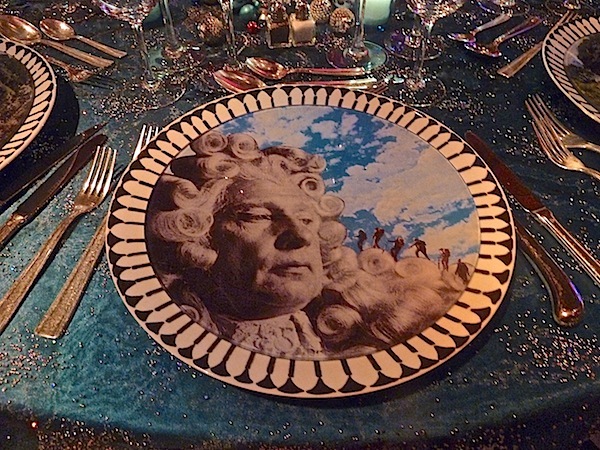 table took the High Society title literally and figuratively. His French hot-air balloon was designed to scale Manhattan’s “social terrain” and it’s geographic ones as well. 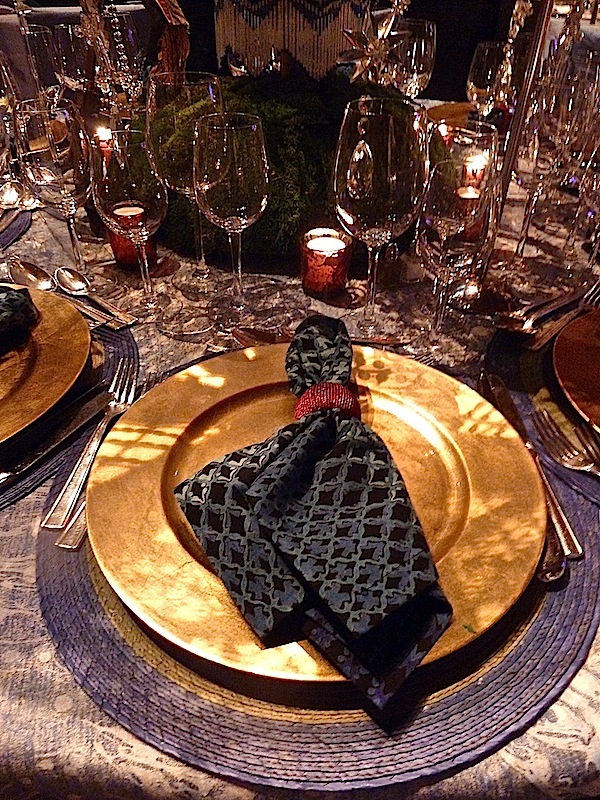 Like an elegant send off for Phileas Fogg, the table featured layered metallics with lavender. And David Duncan Antiques created a second table with a completely different approach. 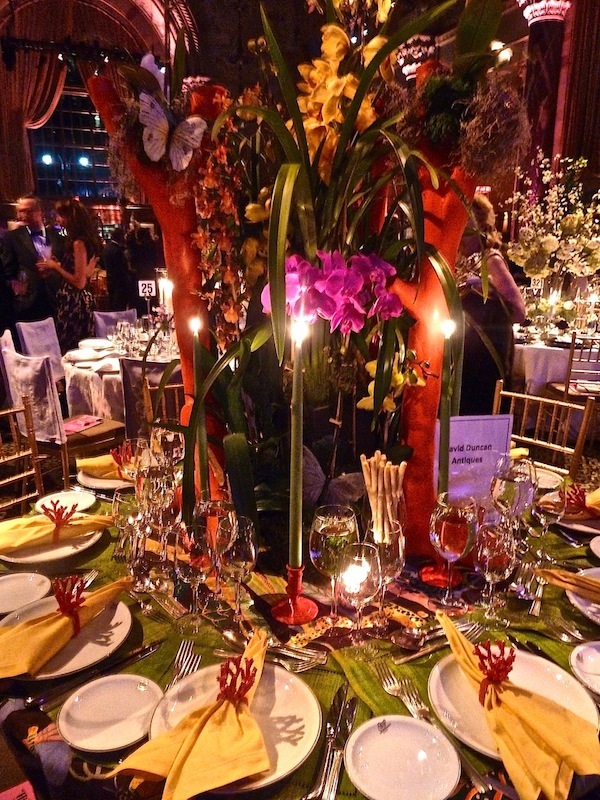 Vivid colors and a lush tropical centerpiece set the tone for a chic island celebration. Fun coral napkin rings picked up the colors from the centerpiece and floral tablecloth. 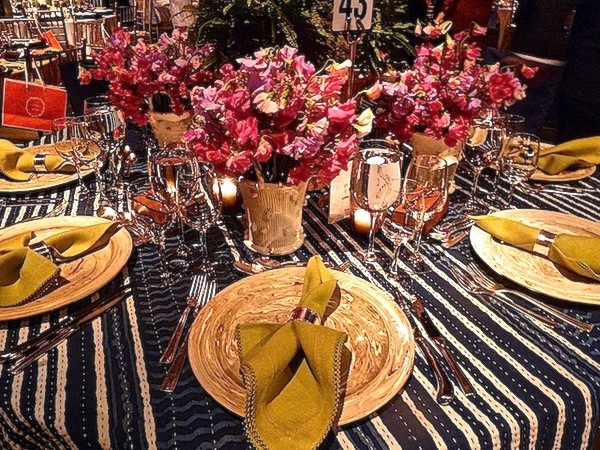 Lindsey Coral Harper’s tables are always brimming with color and creativity and this year was no exception. “The Pink Palace” evoked the vintage glamour of the famed Beverly Hills Hotel. My apologies for the focus – I hadn’t even had any cocktails! 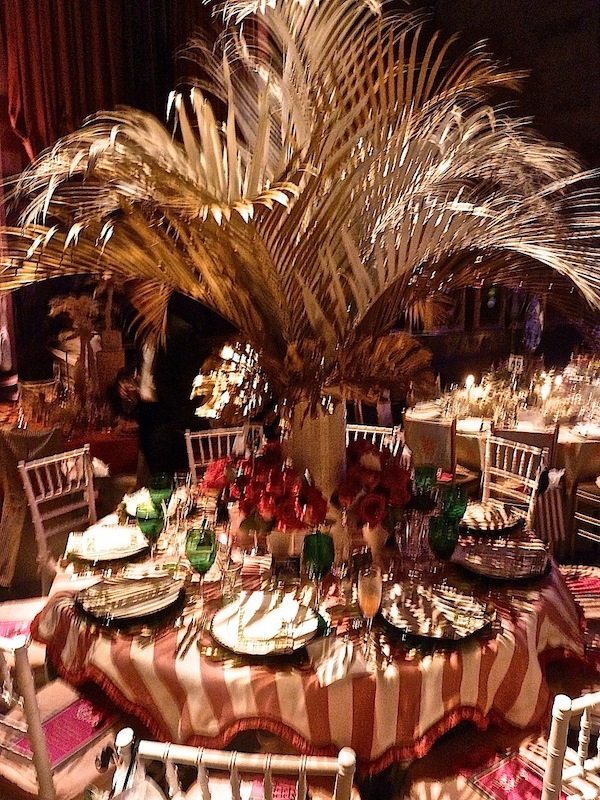 With fabrics from Kravet and Pindler & Pindler, trim from Samuel & Sons and accessories from her own Lamshop, Lindsey designed a setting perfectly poised under the palms in pink and green. Each guest received a room key and small silver frame with a vintage black and white photo. 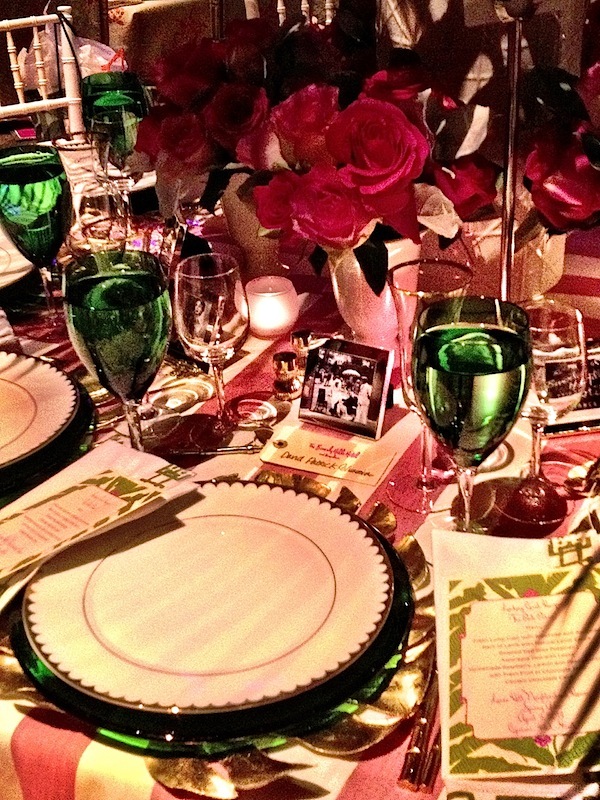 The pretty floral arrangements were from Sebastian Li Events. I think the High Society crew would have been quite at home in this vintage vignette. 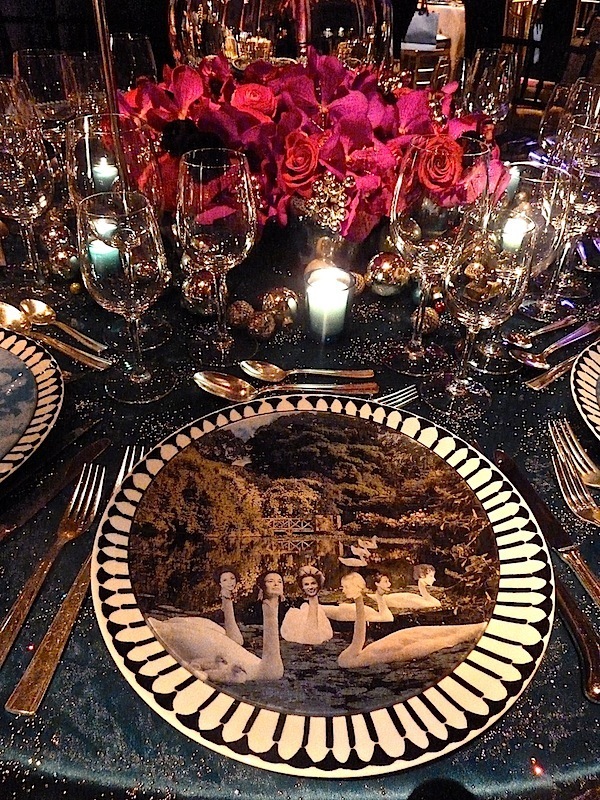 Ceramicist Christopher Spitzmiller named his table Bunny Mellon Garden Table. 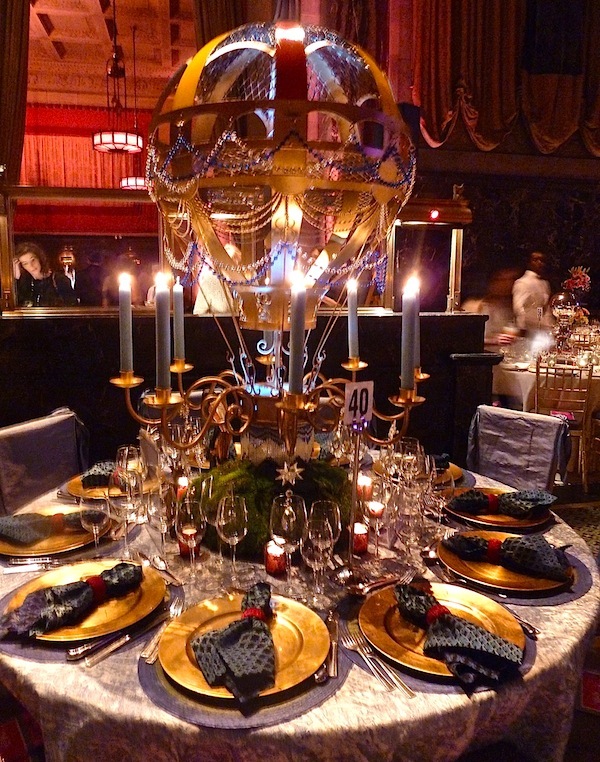 The casually chic combination of elements was topped by the surprise of an exceedingly tall topiary in the center. The understated sophistication is so appropriate for the society scion who put a premium on both privacy and her spectacular gardens. 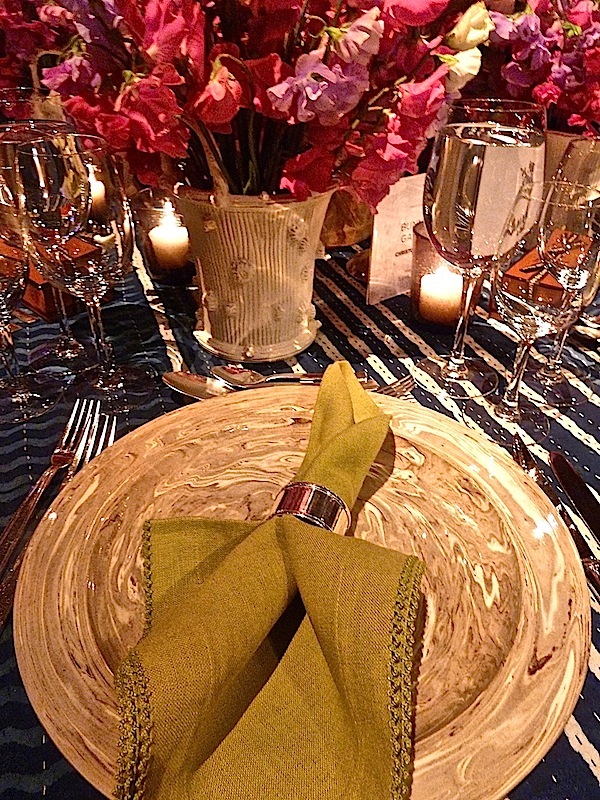 I was in love with the beautiful marbleized plates and faux bois cachcepots that Spitzmiller made for the event – wondering how we can convince him to add them to his product line! 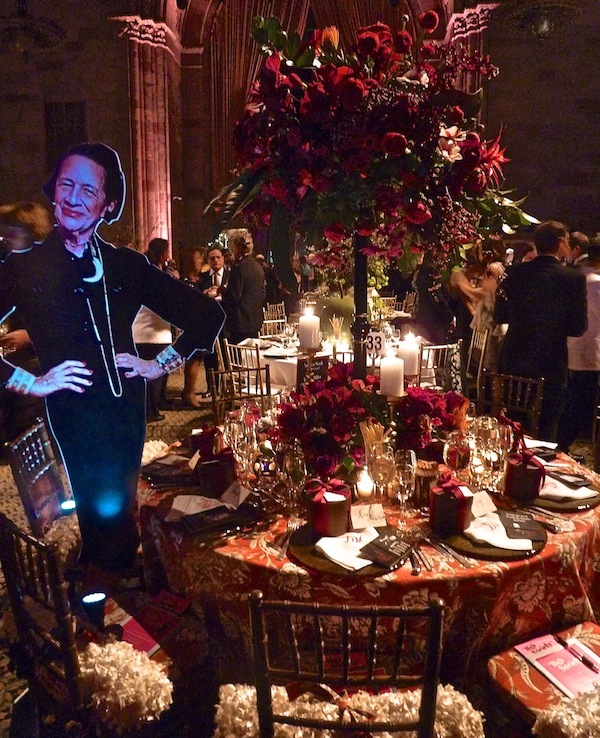 One of the tables that provided the most entertaining photo opps was Andrea Stark’s and Lewis Miller Design’s tribute to Diana Vreeland. Many stood next to the lifesize die cut image of the editor to have themselves immortalized next to the famous fashion icon. 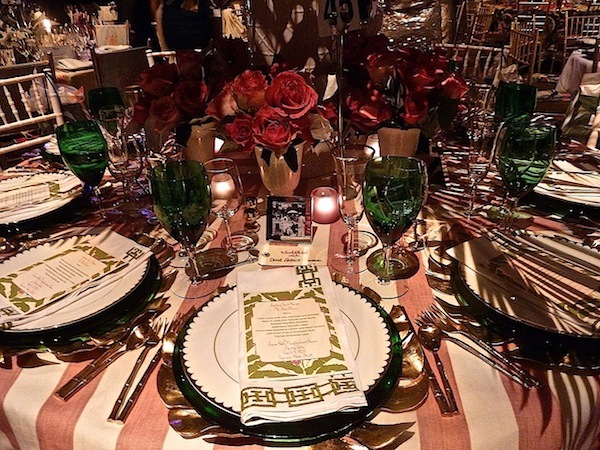 The entire table, like Vreeland’s apartment, was swathed in red, with fabrics from Stark and flowers from Lewis Miller Design. You may remember designerJohn Todd Bishop‘sfabulous Rooms with a View vignette I wrote about in 2011. His room had a clever intellectual component I loved as did his Lenox Hill table. 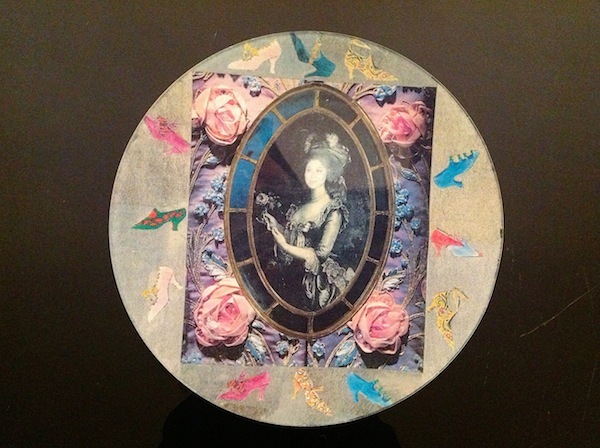 As Todd explained, the theme “‘High Society’ immediately brought to mind society icons of the early to mid 20th century, individuals known for their wealth, style and glamour or their aspirations to dwell among those with wealth, style and glamour.” Todd frequently creates collages for his clients and for his table made decoupage plates, each telling a “slightly surreal, humorous story” of High Society denizens. 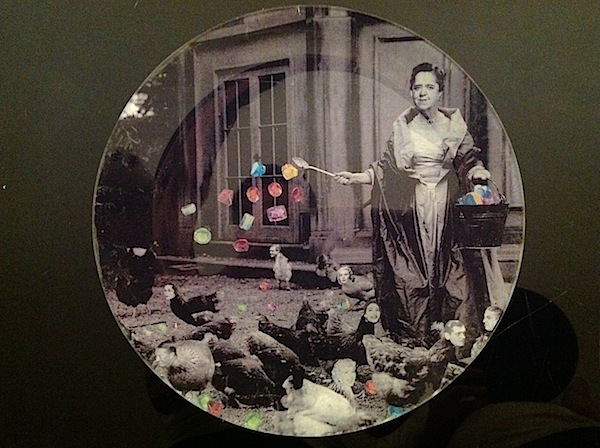 Set on graphic black and white chargers from Treillage, the “frothy artificiality of Cecil Beaton’s early photos” inspired Todd to include mercury glass, satin and a fantastic glittery table topper fabric from B&J. In “Let Them Wear Flip-flops,” Vigee Le Brun’s portrait of Marie Antoinette and Andy Warhol’s shoes symbolize the persona and lifestyle of Imelda Marcos. And lastly, epitomizing the whimsical yet ironic theme of the table, “Feeding Time at Elsa’s” depicts “professional party hostess, Elsa Maxwell feeding precious gems to the half chicken/half human assemblage of royalty, socialites, and performers, who look to her for introductions to each other, as well as a damn good time.” How could you not love these incredibly smart and witty creations?! Truly the work of a thinking designer who connects the dots!! 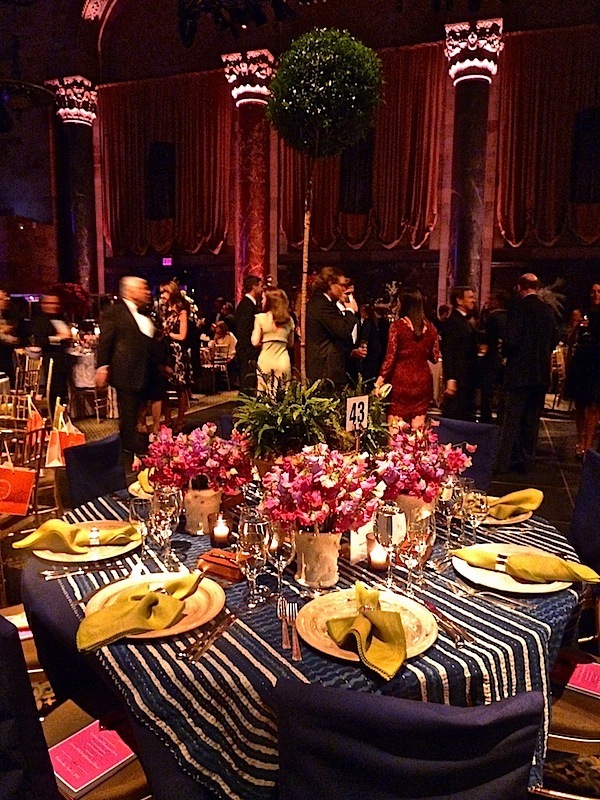 Do stop back if you have a chance over the weekend when we’ll look at more of the amazing tables from the Lenox Hill Neighborhood House gala. This entry posted in design, interior design. 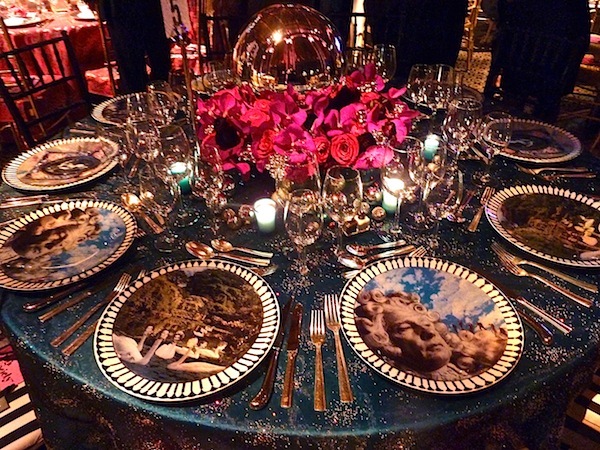 Entry Tags: Tabletop, Tabletop galas, Veranda Magazine Bookmark the permalink. 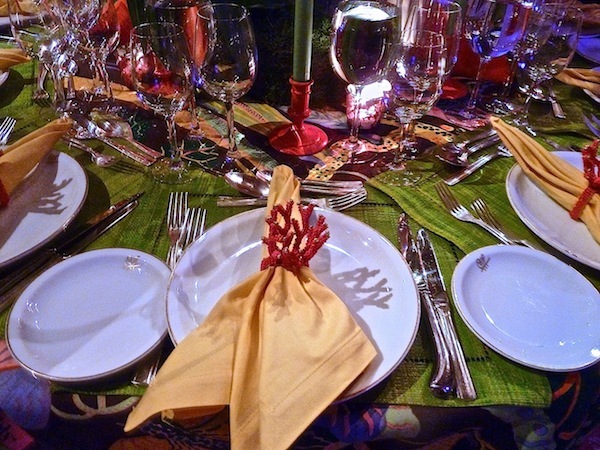 I love these events, I could study all of the little details that make these tables look so spectacular for hours. 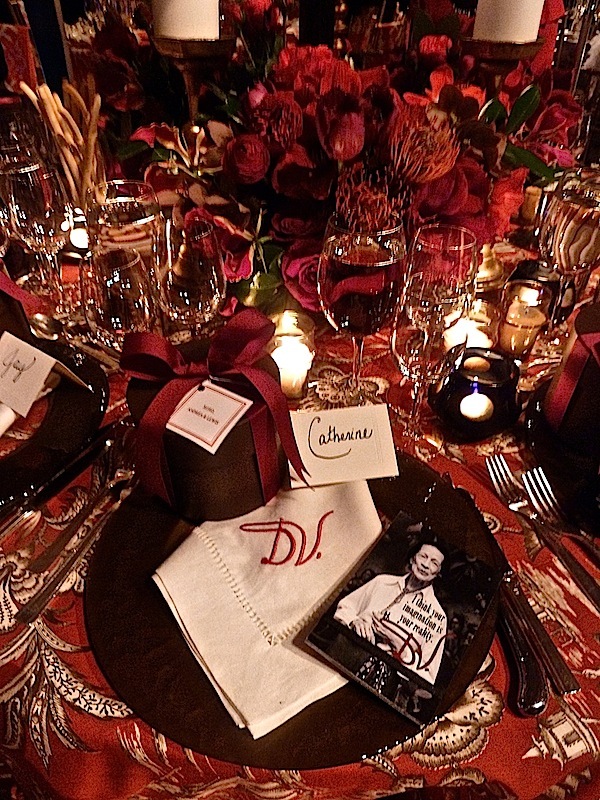 I love the monogramed napkins at the Diana Vreeland table, I hope the diners got to keep them! 78 queries in 0.488 seconds.